It’s lovely to be joining in again with Cathy’s gathering of Monday vases after missing a few. I do so love a good faff with flowers. 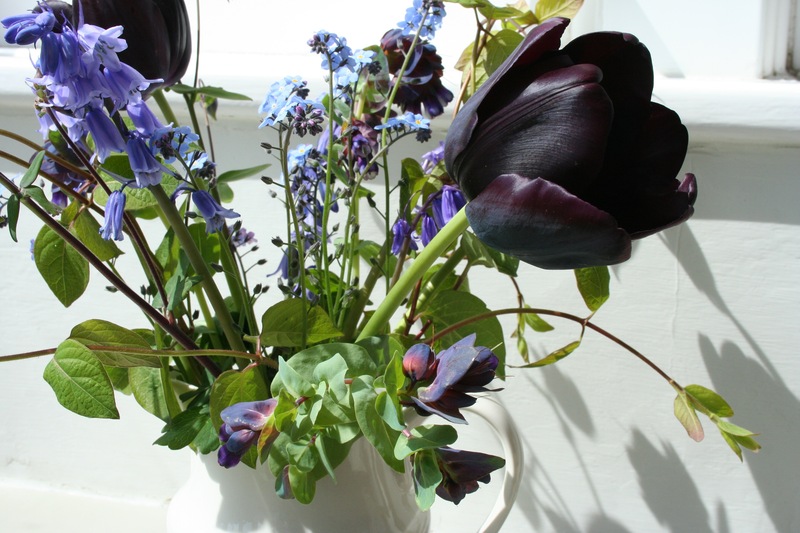 This week, I’ve picked and plonked three ‘Queen of Night’ tulips, some bluebells (from my garden, not the woods! 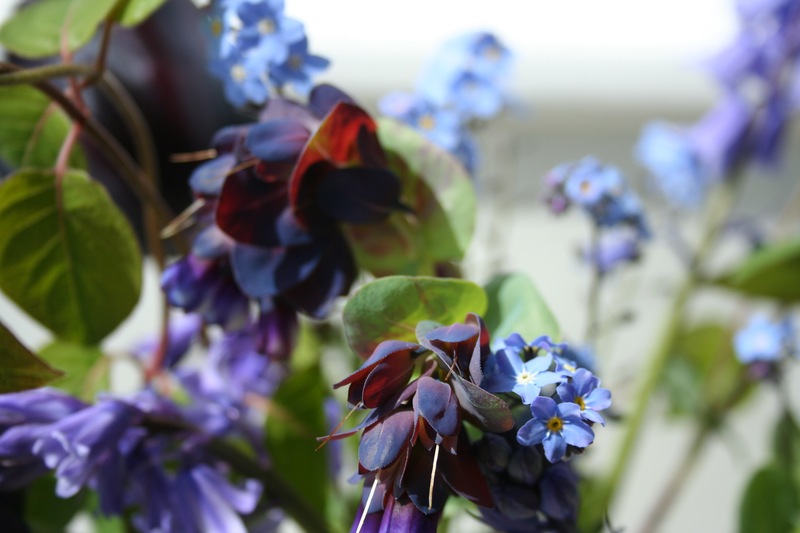 ), forget-me-nots, Cerinthe major, aquilegia and a few tendrils of honeysuckle foliage. The garden is as dry as a bone, the soil dusty. We haven’t had any rain to speak of for weeks now. We’ve had to use the hosepipe to water all the newly planted trees, something we try to avoid doing as our water bills are extortionate; I’ve even been saving any leftover drinking water to pour on those plants lucky to be near the back door. There were promising-looking dark grey clouds (that’s not a phrase you hear very often!) earlier but they passed by without shedding a drop. There are showers forecast for this evening so I have my fingers crossed. Happily, many of our plants are toughing it out and we’ve not been short of April flowers. The daffodils are almost over with just a few multi-headed white ones still looking good (although their top-heavy stems are lolling about, through lack of moisture I reckon). The tulips planted in pots are almost over, while those planted in beds are hanging in there. There are plenty of self-seeded Cerinthe, marigolds and forget-me-nots, and the aquilegias are starting to bloom. The bottom of the garden is covered in bluebells which is amazing considering we were stomping all over it a month ago, clearing pernicious weeds and planting pencil-thin Himalayan birch whips. One day, several years from now, there will be a sinuous river of graceful white birches down there in a carpet of bluebells and other delights. I’ve mentioned my love of tulips many times and how I’d love to have so many in the garden that I can pick armfuls to bring indoors. Well, I’m a little way off that but I have been picking handfuls for the past few weeks – here’s one I picked last week, still looking good in the lounge. 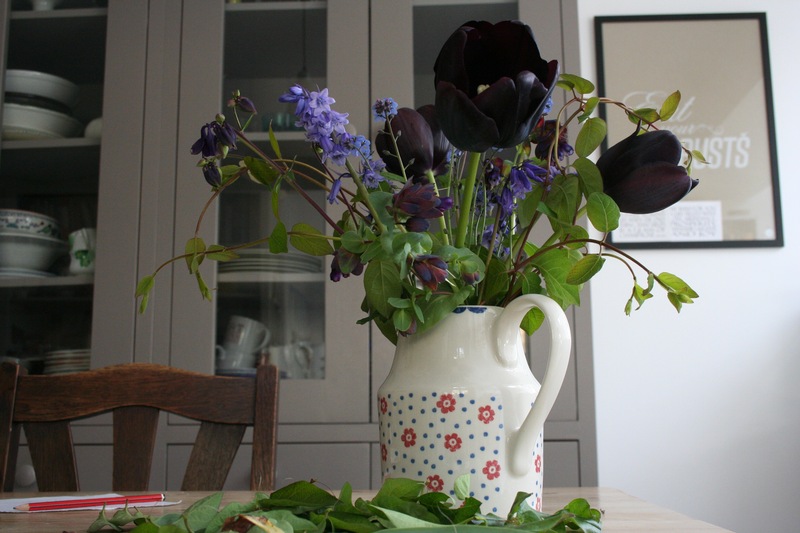 It is immensely satisfying to grow your own flowers to pick and bring inside – a fairly simple task with a massively pleasing reward. Cathy is also showcasing tulips this week. Do go and see, and have a look at some of the many other wonderful vases of flowers from around the world. Thank you for visiting and commenting. It’s been a bit full-on round here recently and I’m behind with responding to comments and blog-reading (sorry), plus the ironing and much more! I hope you have a good week. Our rhubarb isn’t happy either. Recent rain will hopefully perk it up. Hope your matches were dry and went well. 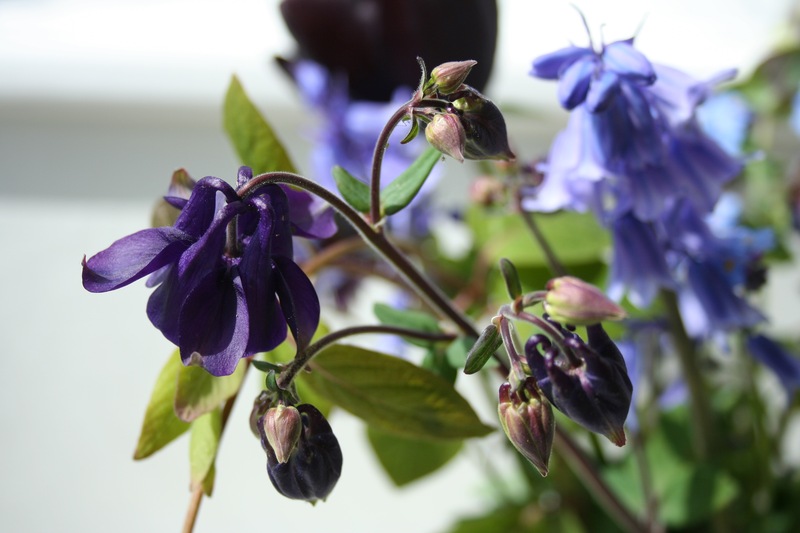 Lovely dark purples – Cerinthe and ‘Queen of the Night’ especially! Thanks Eliza. This tulip is sumptuous. Both your vases are wonderful, Sam. I adore tulips, which are difficult to impossible to grow here even as annuals. ‘Queen of the Night’ is so dramatic! I can sympathize with your feelings in watching the skies – even though our 5-year drought is now considered over, I still watch the skies in the faint wish for rain outside our narrow winter rainy season. We’ve moved into our usual dry period now and summer is fast approaching. I hope you get some rain soon! Thank you Kris. We have had quite a bit of rain this week, thankfully. Sorry you’re experiencing such dry conditions. Your blog is fresh air for me in stifling zone 9 Florida, I miss all the beautiful flowers you photograph, so it’s so wonderful to see them in a personal setting. It soothes my soul. Beautiful happy vase, full of an English spring, Sam! Your description of what your birches will look like with the bluebells made my brain buzz happy for seconds … looking forward to seeing it develop on your blog. We are similarly very, very dry (not so unusual for us perhaps, but exacerbated by heavy frosts). Hoping for rain TODAY and for a couple of days. Let’s hope you get yours too! We have had some rain, Cathy; hope you have too. Yes indeed Sam – even spinach is growing well this year! Yep, darned squirrels. Our dog chases all the squirrels out of our garden. 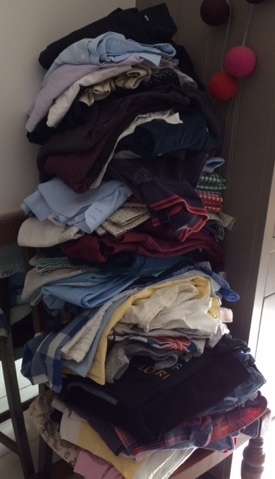 I’ve dealt with the ironing (put most of it in drawers!). That is a daunting ironing pile. 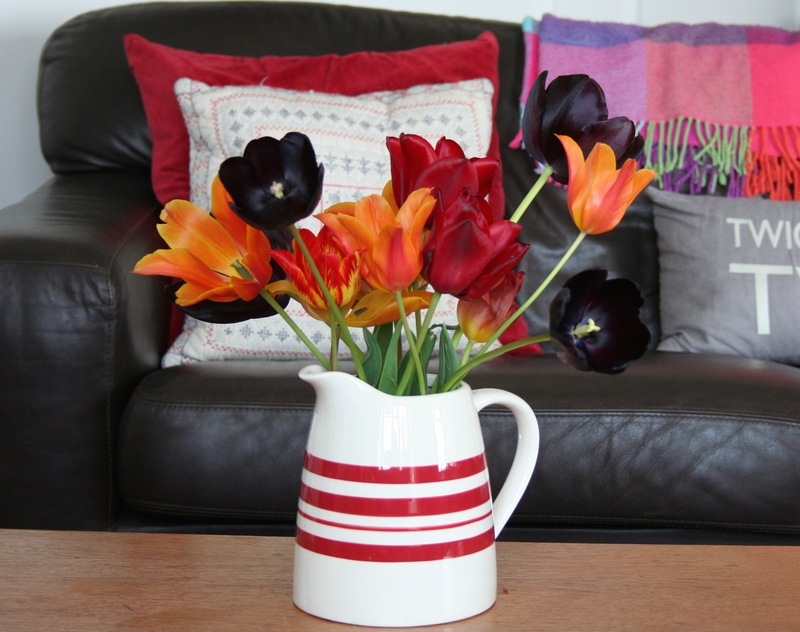 Good thing you have such a gorgeous vase of tulips to gaze over to as you whittle it down 🙂 Hoping the clouds have brought you some relief rains. Ironing dealt with, rain did fall (hurrah) but tulips almost over now (sadly). You at least got tulips! And rain!! Sitting in a semi-arid climate which has had major drought issues I am jealous of both. Even though I am very much enjoying ridiculously low humidity and almost always blue sky days (great for getting out and about) I need green for my soul. Congrats on the ironing accomplishment!!! I see a tulip bulb order taking shape in my head with plenty of those dark beauties. So gorgeous. We have been a bit starved for sun this past month, so I’m doing my best to talk some of our rain clouds into moving across the Atlantic in your direction. Thanks, Brenda – I think it worked 🙂 You could get a whole load of tulips into your plot! Hi Sam, absolutely gorgeous flowers! Writing from drought prone California, I’ve developed the habit of putting a large bowl in the sink at all times, and all water from hand washing, veg scrubbing, general rinsing goes into the bowl, and then out to the garden multiple times a day. Slightly tiresome, but it makes a huge difference. But fingers crossed for rain your way (and mine, for that matter)! Thank you for the lovely photos, as always. Thanks so much for the water tip, Tess. We have had some rain since (hope you have too). The silver birch and the bluebells will look wonderful when they are mature. The tulips are too early this year, I fear they will be all over before our first open weekend. Good luck with your open weekends, Brian. Hi Anna, yes it’s the same one in both vases – Queen of Night. We have had rain this week which is a relief but the soil is still generally dry. 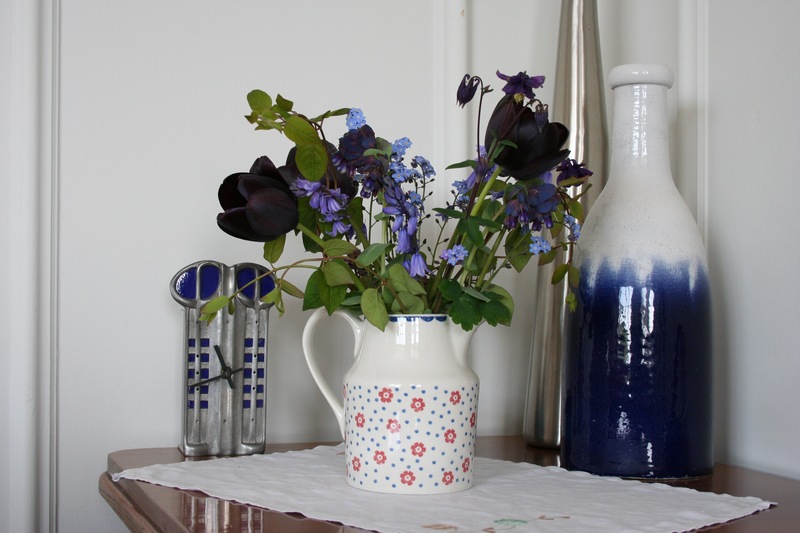 Lovely vase – anything with bluebells is beautiful in my eyes. 🙂 I agree entirely about having flowers to cut. I also have enough tulips now to cut a bunch without noticing any gaps in the garden, and it is so rewarding! We seem to have more this year – hope you have too. I haven’t grown clary sage before but it looks lovely and just the sort of plant I like to grow. I’m so glad the anemone has grown well for you – it’s a beautiful colour. I love tulips, but must say never seen them dark ones before, so pretty!!! 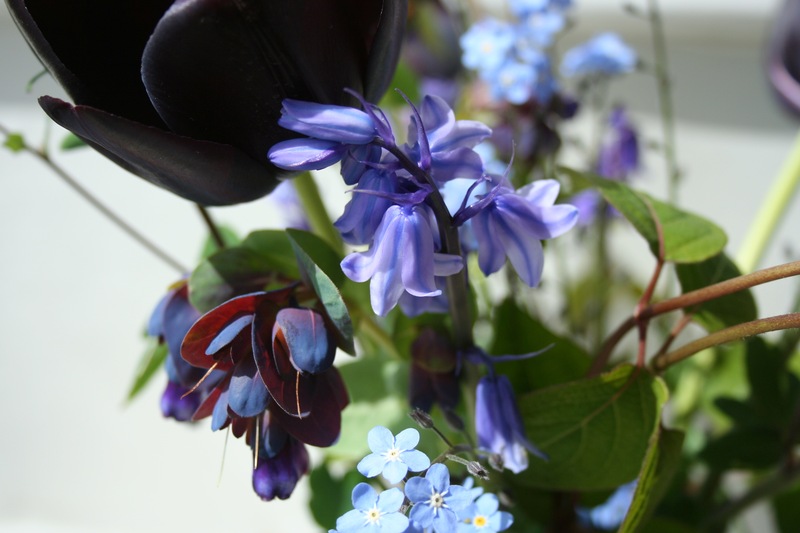 They are ‘Queen of Night’ but you can get other, similar dark varieties too. Your arrangement of red, orange, and dark purple tulips is stunning! Seems like we both suffer from a bit of tulipomania. I’ve been unable to pick any tulips from my “cutting patch” so like you have made a mental note to plant a squillion more times the number of bulbs this autumn. I have lots of cerinthe in the garden, I love it and it’s one of my favourite flowers but I didn’t know it would last in a vase. You learn something every day! Fabulous vase, I absolutely adore all the blues and purples, looks stunning! Thank you Caro 🙂 I love putting Cerinthe in a vase as the colours are so fab.